News: Rem Koolhaas has defended the design of OMA's CCTV tower in Beijing, after the Chinese president called for an end to the construction of "weird architecture" in the country. "I don't have the slightest difficulty in saying, or showing, or demonstrating, that CCTV is a very serious building," Koolhaas told Dezeen, when asked to respond to comments made by China's president Xi Jinping. During a speech at a literary symposium last month, the president said there should be "no more weird architecture" in China, referencing a number of oddly shaped structures that have popped up around the country during its construction boom. Although he stressed that the link between the president's comments and OMA's skyscraper had been made after the speech, Koolhaas defended the building's shape and structure – which has caused it to be nicknamed "big pants" by locals. "[CCTV is] a building that introduces new ways of conceptualising, liberating and realising structure that did not exist in China before, and of which I'm sure Chinese culture and Chinese architecture will benefit," he said. "It articulates the position and the situation of China." 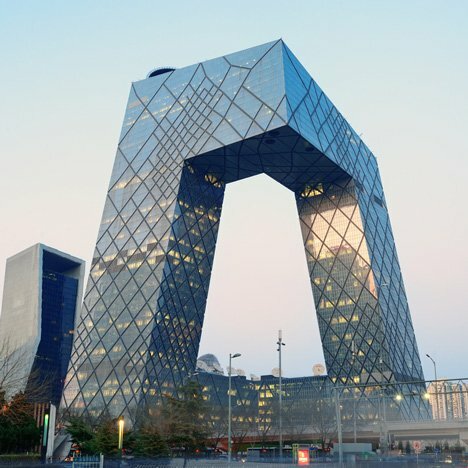 Completed in 2012 as the headquarters for China Central Television (CCTV), the 473,000-square-metre building comprises two towers that lean against each other and are connected by a 75-metre cantilevered section. "The building makes a serious effort to organise a complex entity like CCTV into a coherent whole," Koolhaas said. The Dutch architect was speaking to Dezeen after his talk at the Herald Design Forum as part of Seoul Design Week 2014, which opened today. During the event, Koolhaas also mentioned to a group of journalists that he hopes to "have a conversation" with the Chinese president about his comments. Koolhaas curated this year's Venice Architecture Biennale, which concluded on Sunday. He dismissed comments by architect Peter Eisenman that he had used the biennale to state "the end" of his career. "My response is to continue working on my career," Koolhaas told Dezeen. Image of the CCTV building is courtesy of Shutterstock.